A forest where all the trees are uniformly deformed. These are pine trees which were planted in 1930. Around 400 trees were planted and when they grew, all the tree trunks bent towards the north. 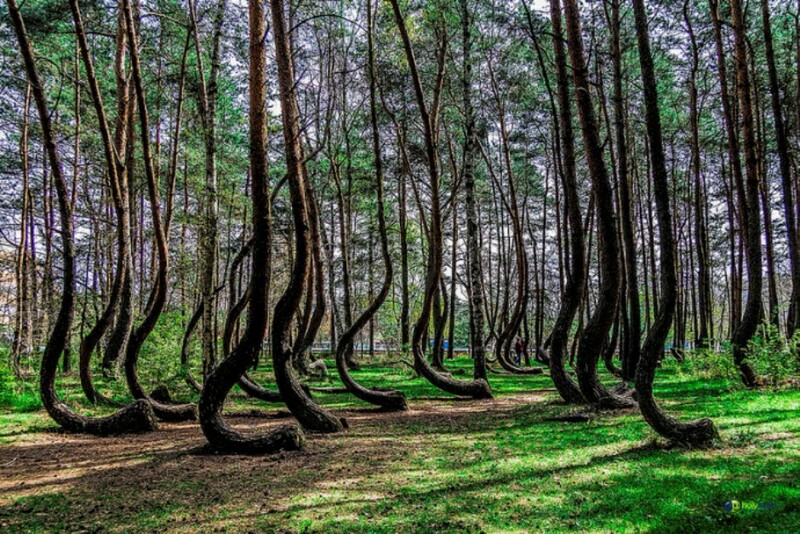 This groove of the bizarre curved pines is near Gryfino in western Poland and is called the Crooked Forest. All the trees of the Crooked Forest have the same 90-degree bend northward at their base. The reason why the trees have adopted this weird shape is still unknown. This unique site still is a big mystery. The crooked forest is surrounded by a large forest of straight growing pine trees. Only the 400 trees of the crooked forest have this haunting bend. It is estimated that the trees must have grown normally for about 7-10 years and then some human intervention must have caused this curve. Despite the bend, the trees have grown tall and undamaged. The small town where the trees were planted was completely ruined in the Second World War and was only reestablished after the 1970s. This is the reason why no one knows about the trees. It has been speculated that the trees must have been bent by some form of tool or technique. The reason and the technique are however still not known. 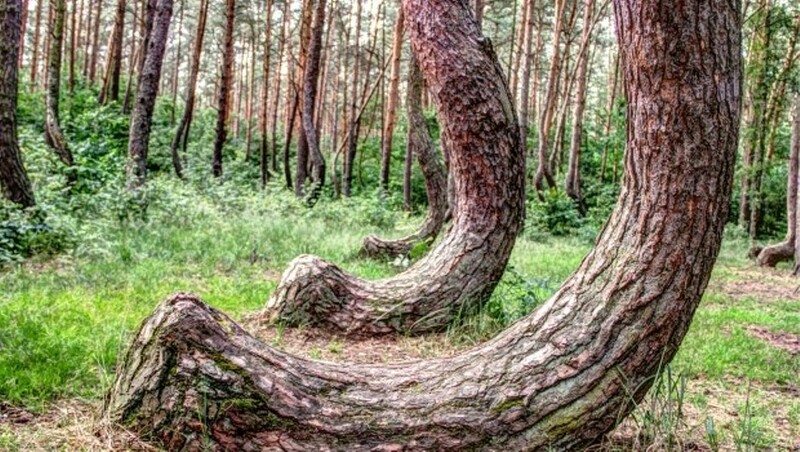 It is said that a group of farmers planted these trees and gave them the shape to create naturally curved timber for using it as a construction material in furniture or ship building. During World War 2, the invasion of Poland must have interrupted the work of these farmers and they must have left these peculiar trees as we see them today. Some say that a strong snow storm might have knocked the trees. Some say that the gravitational pull in that area might be responsible. Another reason given is that during the time when Poland was invaded the enemy tanks must have ploughed through the young forest flattening the trees. Then these flattened trees grew back crooked. All these reasons are imaginations and there is no witness who can testify them. Finally the cause of the Curved Forest still remains a Mystery.